It all began on a Sunday afternoon in March, 1978. At the city stadium, two teams of 8-year-old children played an exhibition soccer game before a scheduled professional match. The youths displayed such ability for their age that the spectators were delighted. The names of the two teams were "Bloomingcito" (little Blooming) and "Orientito" (little Oriente), which are diminutives for the names of two professional teams of Santa Cruz. But, how did these teams come to be and what did their acceptance give rise to? Rolando Aguilera Pareja, who later founded the Academy, had returned to Santa Cruz, Bolivia, after seven years in the United States. He returned with his children who had learned only baseball and American football. Being a son of Ramon Aguilera Costas, a famous soccer player with Santa Cruz's Blooming in the forties and fifties, Mr. Aguilera wanted to keep the soccer tradition in the family. To that end, he contacted Dede, a Brazilian soccer star living in Bolivia, that he might train his children Roly and Erwin in the family's own backyard. Soon after, other children in the neighborhood joined in and the idea of forming "Bloomingcito" arose. But forming a team was not enough. An opponent was also needed, and that was the task of Ladislao Jiménez, the ex-goalie of Oriente Petrolero (the other local team). Consequently, "Orientito" was born and that is how that first game took place on that memorable Sunday in March. Many parents then became very enthusiastic and soon there were over 200 applications for registration of children of different ages. As a result of this, Mr. Aguilera took the initiative to organize a soccer academy for youth. In the regional Chiriguano Indian language, "Tahuichi" (pronounced tah-WEE-chee) means "Big Bird." It was the nickname of Mr. Aguilera's father, in whose honor the "Tahuichi Aguilera" Academy was founded. The Academy was formed as a not-for-profit sports institution on May 1, 1978. Its primary focus then was children's recreation and the development of the basics of soccer. Tahuichi was not yet a year old when it won the national championships. Soon after, it made international news when it tied 0-0 with Sao Paolo (Brazil) during the preliminary match of Bolivia versus Brazil in the 1979 Copa America. 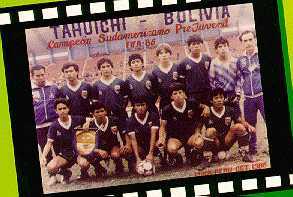 In January 1980, in Buenos Aires, Tahuichi beat Independiente of Argentina 4 -1 in front of 50,000 spectators to win the South American U-14 Championships. Club Palmeiras of Brazil finished third. With the emergence of the "Tahuichi Aguilera" Soccer Academy, a new international image of Bolivia's youth soccer had been born. From then on, the rich sporting history of the Academia "Tahuichi" has been written with great deeds cheered throughout more than 20 countries in the Americas, Europe, and Asia. Tahuichi today hosts over 3,000 boys and 400 girls between the ages of 3 and 18. In the Academy's 30 plus years of existence, more than 150,000 children have passed through its doors. Most of them, from the streets. Promote and stimulate youth soccer as healthy recreation and preventive action against drugs, alcoholism and other negative influences on youths. Provide complimentary health, nutritional and educational services for the children. Provide for the further development of those children with innate ability and talent to become professional soccer players. Obtain college scholarships in the USA and other countries for those who aspire and have the vocation to study. Cultivate unity and peace among nations through soccer and the successful integration of children of the world.